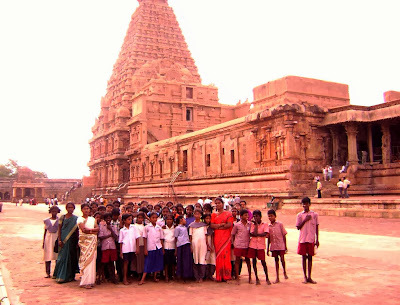 SEVAI Special educators’ team under IED Project had gone to Thanjavur with 42 special children on a field trip to the Thanjavur Big Temple to teach them how to find a monument, look at it. Divakumar, then coordinator of SEVAI of IEC Project reported “The teachers and children seemed very interested in the temple architecture.Thanjavur, a calm town tucked away in the interiors of Tamil Nadu now, once was capital to a sprawling Empire that extended from the fertile plains of Kaveri river to Mekong Valley. The Cholans who ruled the major part of Southern India for almost 1500 years, built this massive temple - Brahadeeswara Temple or Big Temple.The perfect symmetry of the structure, the elaborate arrangement of impeccably sculpted stone figures adorning the outside walls and the visual symphony of the large stones meticulously placed one atop another with amazing mechanical precision - is breathtaking. Cholan Temple architecture's hallmark is the Vimana Tower surrounded by a richly ornamented Gopuram gateway constructed out of granite stones. The main temple at the time of completion in the year 1010 consisted of a Sanctum Sanctorum tower known as Sri Vimana, a big rectangular mandapa with an intervening vestibule known as Mukha Mandapa. The Sri Vimana has a large granite stone structure as the basement to lend structural stability for the massive towers upon it. The temple tower - Vimana is one of the tallest towers of a temple and has a monolithic octagonal stone cupola weighing 82 tons. There is a stone bull (Nandi) looking at the main deity - Shiva - inscrutable and eternal. Raja Raja Cholan constructed this before 1000 years with out any technical instruments. i am say this is 8th world miracle. The Kumbam (structure on the top) of the temple is carved out of a single stone and it weighs around 80 tons in this kumbam shadow never falls in ground The Lingam measures 9 ft in height, 23.5 ft in circumference. The Lingam was brought from the shores of Narmadha River. This Lingam is also called as "Raja Rajeswara Mudaiyan" because of its bright appearance.